HLST stands for “Heavy Lunch Surf Team”… and ever since I have worked freelance my company has been The Heavy Lunch Surf Team Limited and it forms the operational backbone of Mombee Design, Mombee Bikes and the rest. The Heavy Lunch Surf Team grew out of a name coined by a bunch of friends in the mid-80’s and kind of stuck. Thereafter it appeared in various guises through my adventures, ups and downs. Twenty years ago the Heavy Lunch Surf Team was a bunch of friends who spent the weekends surfing (kayaks, skis and boogie boards) and windsurfing around the beaches of south Wales, Devon and Cornwall. Right now “The Heavy Lunch Surf Team Limited” is providing a variety of programme management and delivery services. It’s an active company with a good track record and a legacy of happy customers. 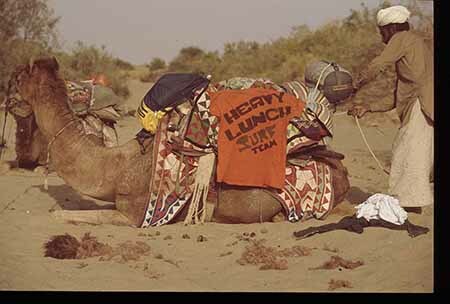 Will “The Heavy Lunch Surf Team Limited” still be an IT company in another ten years time? I suspect that it will evolve into a more creative/design orientated company. The process has already started with my interests in graphics and creative arts playing an increasing role in the work that I do. Travelling with the HLST in Rajastan.